The Malaysian Air Force officer who told the media that indelible ink used in the 2013 general election was ineffective has been sacked. The judge said officer Zaidi Ahmad breached military protocol by making the media statement. 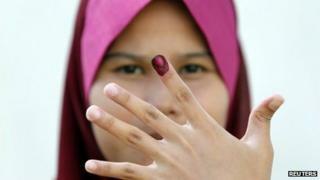 The opposition coalition claim the use of faulty ink combined with fraud cost them victory over Malaysia's governing coalition in May 2013. The coalition has been in power for more than five decades. Malaysia's Rakyat Post newspaper reports that Major Zaidi Ahmad was dismissed with immediate effect under Section 89 of the Armed Forces Act. The military court's five member panel dropped other charges against the officer but found him guilty of not going through military channels to voice his grievances and leaking a document on the indelible ink to the media without obtaining approval from the Armed Forces. Major Zaidi said the charges against him were politically motivated. Following the election there were several reports claiming the ink used at polling stations to identify who had voted could be easily washed off. Malaysia's ruling coalition led by Prime Minister Najib Razak's United Malays National Organisation (UNMO) won nine out of 12 states in the 2013 election, but with a share of the popular vote below that of the opposition coalition under Anwar Ibrahim. It was the governing coalition's poorest showing since 1969.